This was taken the day before my birthday five years ago. 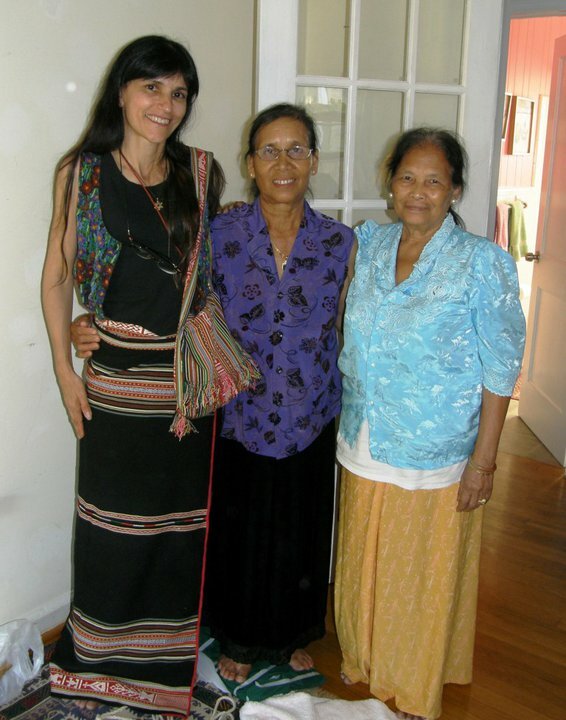 I was in North Carolina and went to visit some ladies from Vietnam – Montagnard, or hilltribe, backstrap weavers – to look at their textiles and watch them weave. They dressed me up in one of their traditional skirts. 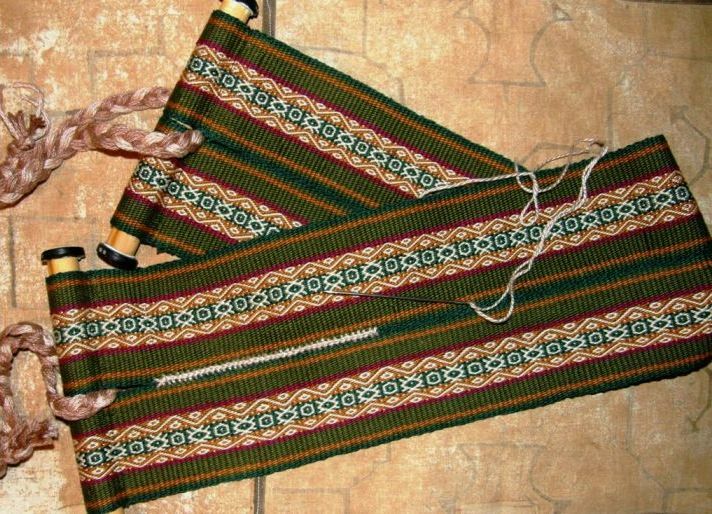 The skirts are made of two panels which are woven on backstrap looms. The panels are sewn together and the join is covered with decorative stitching. The entire piece is then placed on a frame so that it can be edged with weft twining. They also gave me one of their shoulder bags to carry for the picture. The following day I returned to watch Ju Nie prepare her warp. I learned a lot about her use of the coil rod on a circular warp and heddles that are applied during the warping process. It was a perfect way to spend a birthday. I was lucky to be able to return to visit Ju Nie and Ngach again a few months later and study their weft twining technique. I went home and wove something to put into use some of the things I had learned and seen…a patterning technique using warp floats, patterning with supplemental weft and weft-twining. I can’t believe it has already been five years since I did this. It takes me back to the time of my beginnings in the online weaving communities, the purchase of my first digital camera and the start of this blog. So much has happened since then in my world of weaving and even more had happened prior to that. I am in my 20th year of backstrap weaving now. 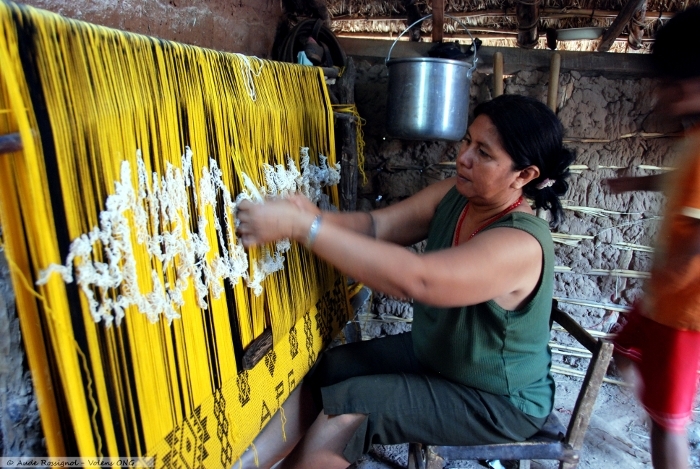 I can’t believe that it has already been eight years since I went to coastal Ecuador to study cotton spinning and weaving with Trini and her family. This has been on my mind because my friend, Janet, has just returned from time spent with this same family and it has been amazing seeing some of her pictures. Trini’s nieces and nephew have grown and one even has a child of her own now. I am waiting for Janet to send me pictures so I can show you. She has been busy practicing the simple warp float technique that she learned there…the patterning technique that you see on the piece in the above picture. She also came back with the confidence to warp up a 10-foot long piece using a dovetailed warping system (see below) on a large vertical frame to make a plain-weave panel for a hammock. 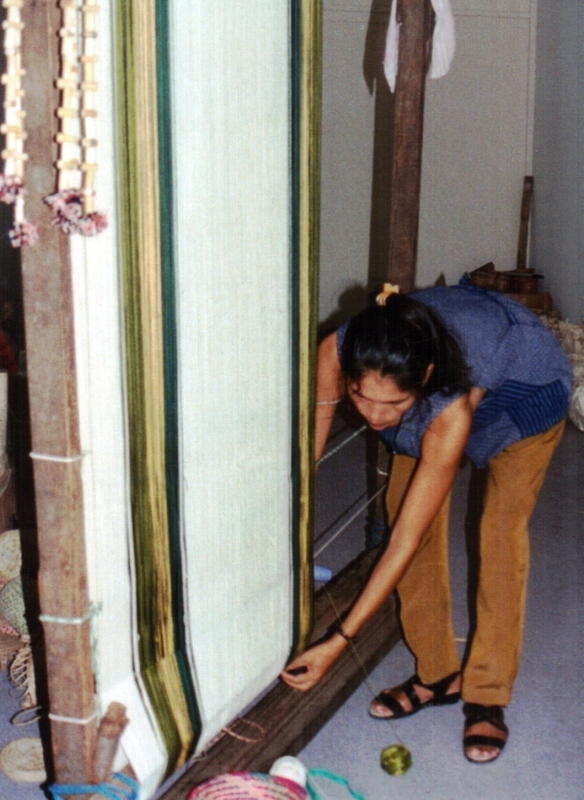 She will weave and sew two panels together to make the complete hammock in the same way that my Vietnamese hilltribe teachers sew panels together to make their skirts and blankets. The dovetail warping system allows a weaver to work her way around the circle of warp and then open out the cloth once it is off the loom without having to cut the warp ends. Stick D in the above drawing is simply removed and the intact end loops of the warp can be used to form the ends of the hammock. 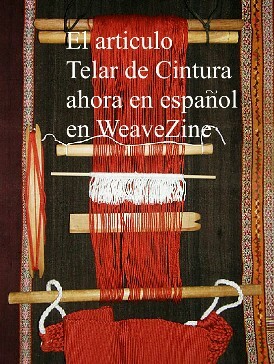 Guaraní weavers here in the Bolivian lowlands where I live also use this system. They use vertical frames and cotton thread and weave their hammocks with pick-up patterns all in one piece. Picture courtesy of Aude Rossignol. 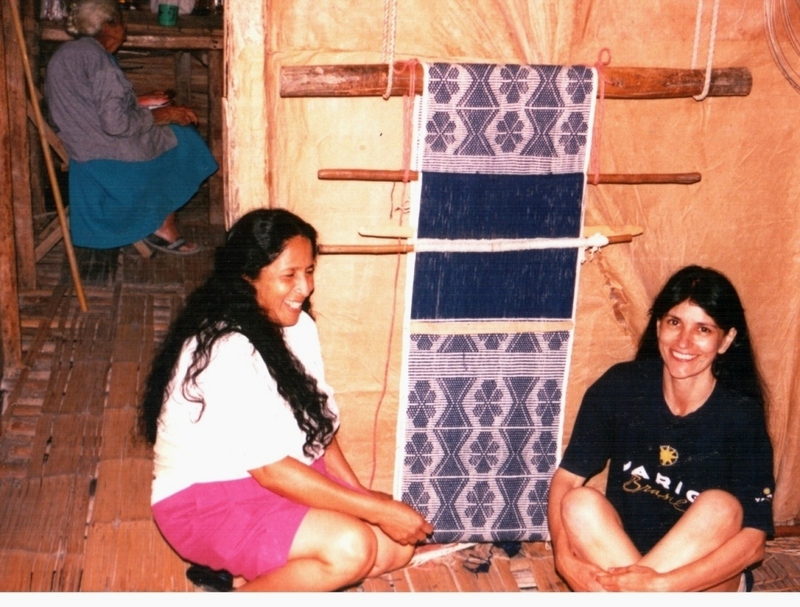 It’s been thirteen years since I first met my Guaraní teacher, Angela, pictured above warping for a hammock, here in Santa Cruz. She left shortly after to return to her community. It was only in 2010 that I found her again back in the city. I have had the joining of woven panels on my mind lately which is partly what has been responsible for all these thoughts about my past experiences with this practice and the weaving teachers who showed it to me. My latest project is about weaving two identical panels and then joining them using a decorative stitch. You can see the stitching down the center. 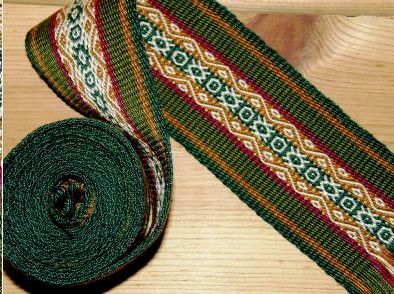 I also joined a long belt that I started weaving on a floor loom at a friend’s house and finished at home on my backstrap loom. This is the piece that I used to put together my instructions for Andean Pebble Weave on a four-shaft loom. I cut the long strap in half and sewed the two pieces into a backstrap. 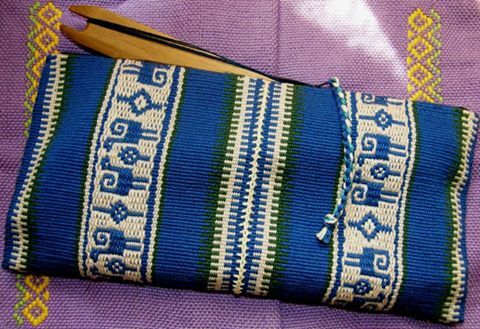 It has been used by many people who come to weave with me and is a favorite. I used the same stitch as the one I used on the tool bag for this project. I came across some belt weavers in Peru who sew their pieces together to make satchels to sell to tourists. 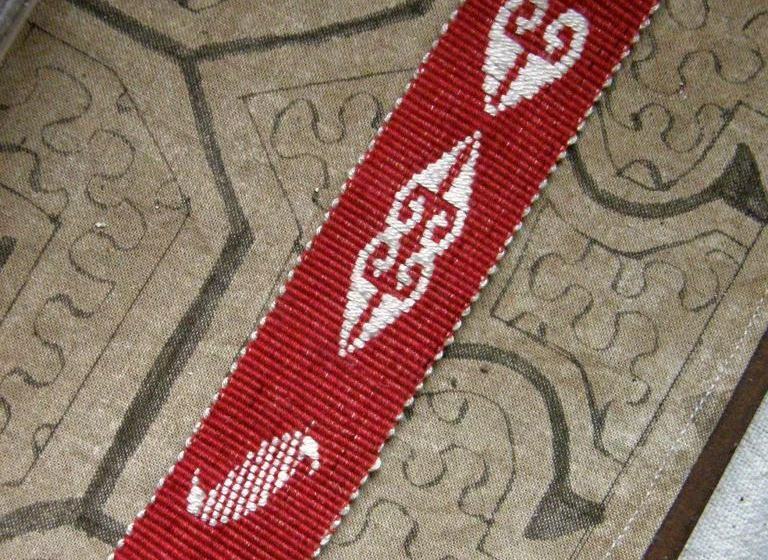 They create neat joins which they do not cover with embroidery. I decided to be moderate in the width of this project rather than fill my loom bars up completely with thread. Weaving two very wide pieces with pick-up patterning and joining them is my ultimate goal. These panels are just under 12” wide with 1100 ends of Guatemalan cotton in each. I am weaving a pattern using silk supplemental weft along the four edges and leaving the center blank as I hope to sew large stitches over the seam where the two pieces will be joined. The project has progressed with all the challenges that I had anticipated and then some more! Firstly, I wrongly assumed that this brown cotton from Guatemala was the same as the red cotton I used in the project I showed you in my last post. I calculated to get a 30cm width based on measurements taken from the red piece but, once I started weaving, the piece clearly did not want to be that wide. So I unwove and started over at 27.5cm. 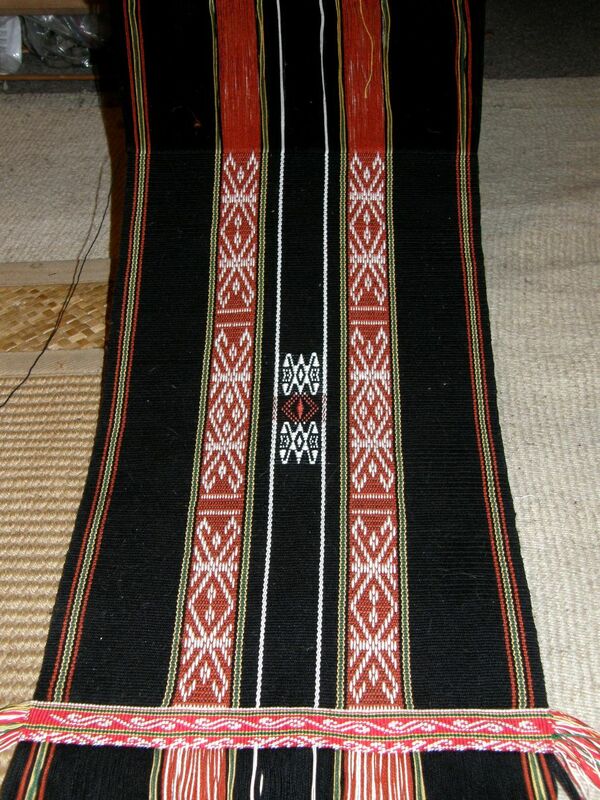 Both panels have exactly the same number of ends and are the same width yet the one on the left is exposing more of the white supplemental weft than the other. I have three broken warp threads in the one on the left and several others are looking kind of sad. Meanwhile, the threads on the one on the right are in excellent shape. I am scratching my head about that. I also have to be on the lookout for the need to adjust my beat as the picks per inch on one panel tend to outnumber the ones on the other. So far, it is pretty much under control. I expect the embroidery over the join will be another challenge and I think I will practice on other cloth before I attempt it it on this piece. 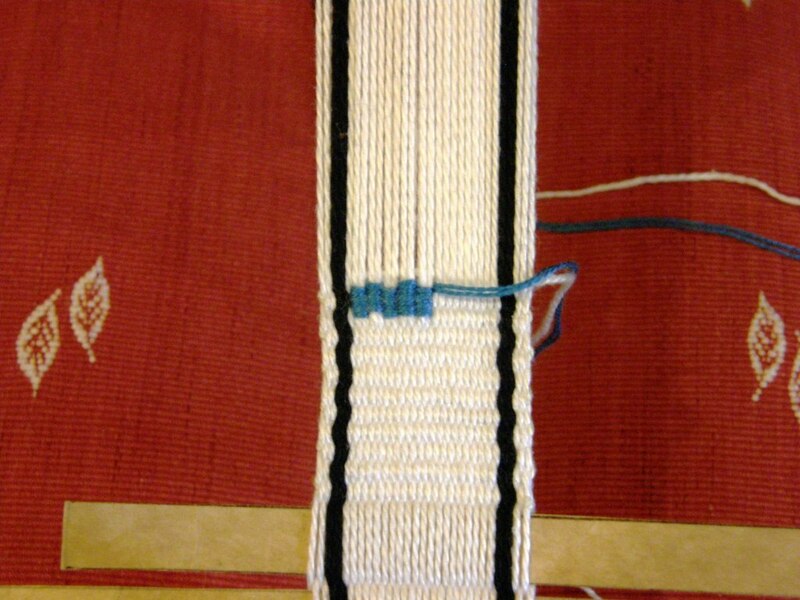 I have the idea that creating identical panels in plain weave in this fine thread may be more difficult than doing so using a warp-float structure. I think that finishing this project will place me in a good position for a second one in Andean Pebble Weave. I played around a little with supplementary-weft designs before starting this piece. I had seen a picture online of a flower motif and wanted to try something new in the way I used the supplementary weft. The image was so tiny that it was impossible to see any kind of detail by enlarging it, but it gave me ideas. One of the limitations of the single-faced supplemental-weft patterning technique that I use a lot is that you can’t really create and fill in large solid shapes. You are limited by the length of the weft floats. This is simply because very long floats are not practical. They won’t lie flat and can get caught on things and pulled. One of the supplementary-weft threads around the buttonhole in this bag that I made got pulled right out of the shed. It got caught on a finger nail as I fastened the button. It was too long and placed in a high-traffic area. Naturally, the finer the thread you use, the more detailed the patterns can be. With fine thread, the weft could float over 15 warp ends, for example, and not cause any problems, whereas heavier yarns might make anything more than a 5-span float impractical. This means that if you want to fill in a large shape with supplemental weft, you need to break the weft floats into several short segments. I am not even sure if this is a handwoven piece of cloth or what the technique is but I like the idea of having the shapes of the leaves and petals broken into those regular diagonal sections. It gives the shapes the look of being solid without being heavy. It is a lovely delicate look and I would love to create something like it. At the bottom of this red band you can see my first rather clumsy experiment with this idea. I wasn’t pleased with this and will definitely keep working on it. In the meantime, I decided to go with something more Andean-like for the current project and wove a couple of samples to test design proportions. 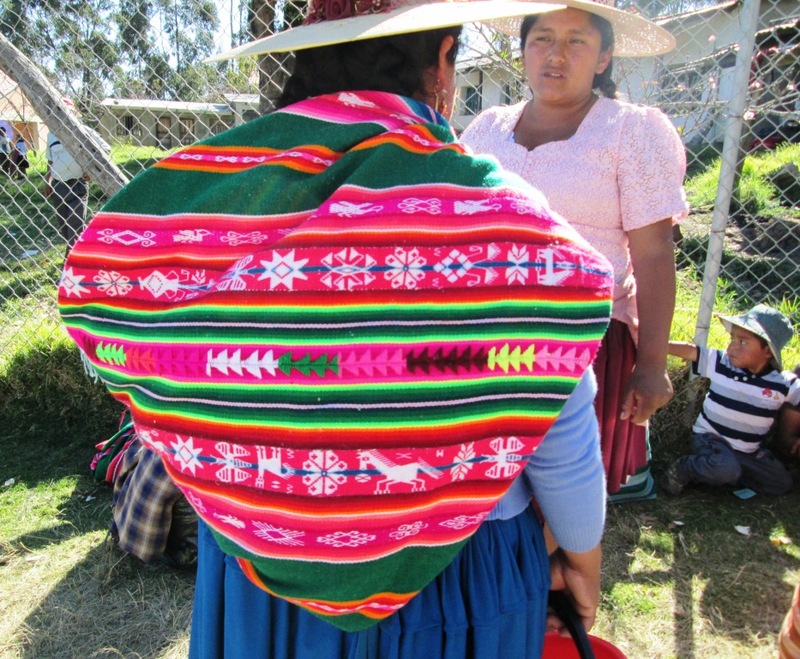 My Guatemalan weaving teachers have their ways of dealing with large shapes. I took out my Guatemalan samples pieces and journal to refresh my memory and, again, I had to pause in disbelief at the realization that it has already been 7 years since I went there to study. 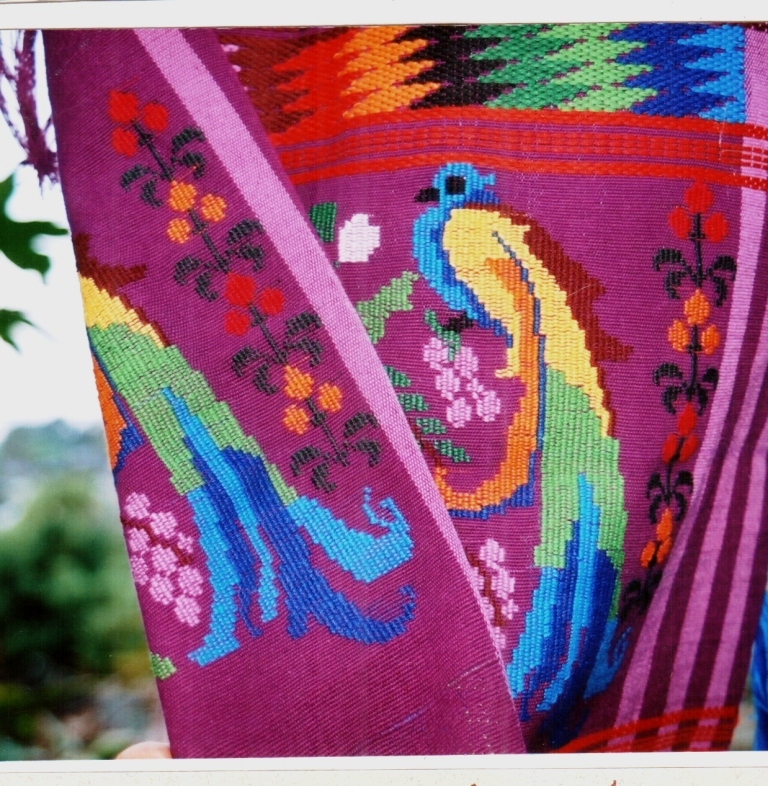 Below, you can see one of the patterns that is typical of San Antonio Aguas Calientes. You can see that the large shapes, that look quite solid when viewed from a distance, are made up of several short weft floats. Three short floats take the place of one long one which would simply not be practical on a woman’s blouse. 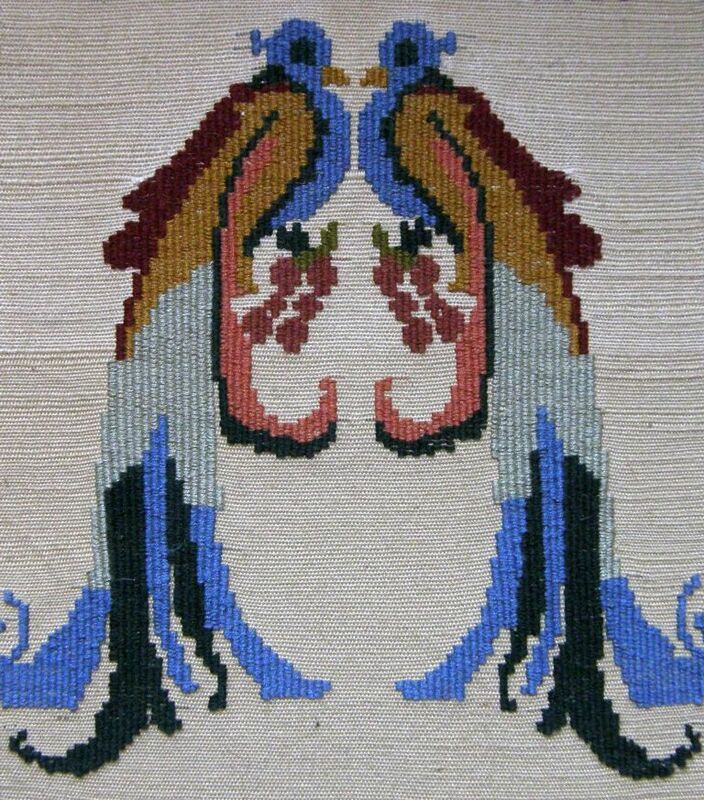 The bird and flower motifs that I wove above are made with the double-faced technique. The motifs look exactly the same on both faces as you can see below. 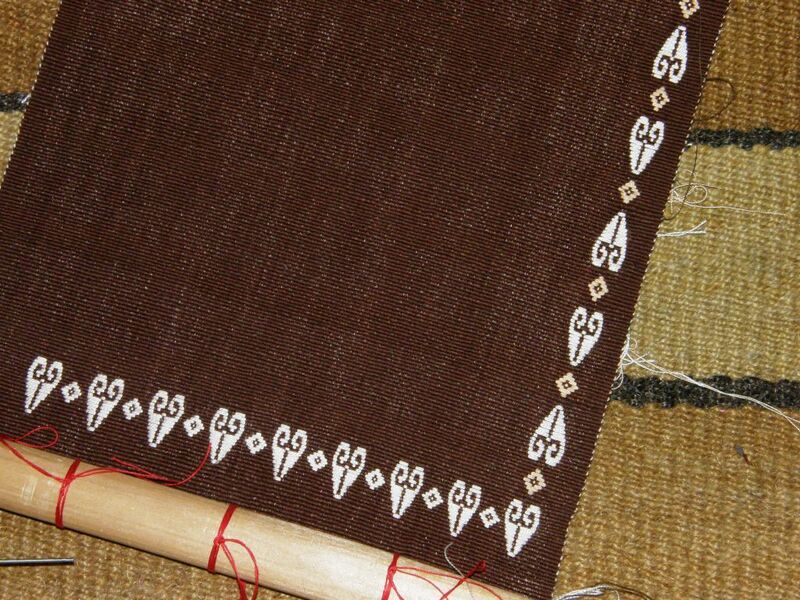 Although the figures actually comprise a series of several short weft floats, they look solid. Here’s a brief explanation of how the double-faced method works. This is not meant to be a tutorial as I have not gone into details of thread weight and how to actually start and end a pattern. I just want to give you an idea of how the solid look is created as I have been asked many times about this especially by my backstrap weaving friend, Eladio, in Mexico. I hope he is reading this! The ground cloth is warp-faced plain weave. The next shed in the weaving sequence is opened and the band is beaten. Then, blue supplemental weft is worked over and under the warp ends on a closed shed, that is, the weft goes over and under all the threads rather than just the threads in any one shed. The supplemental weft goes over and under groups of four warp ends…two ends are taken from the upper layer of threads and two from the lower layer to form this group of four threads. 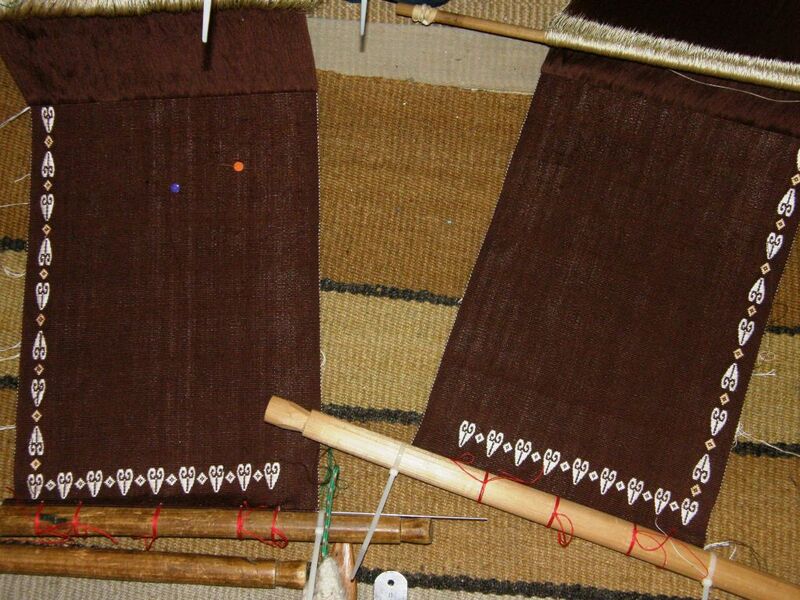 In the first picture, you can see the weft going from right to left over, under, over, under four groups of threads. The weft then turns around behind the last group and passes from left to right (see the second picture above) going over, under, over, under. The supplemental weft needs to be laid quite loosely in the shed. The original shed is then reopened and the main white weft is passed. The next shed in the sequence is then opened and the band is well beaten. The two passes of supplemental weft will pack to look like a solid line. After beating, it is time to use the supplementary-weft again on a closed shed to build up the pattern as you can see below. The supplemental weft shows on both faces of the band. Below, you can see the little bee motif which was the first one that I was taught by my Guatemalan teacher. 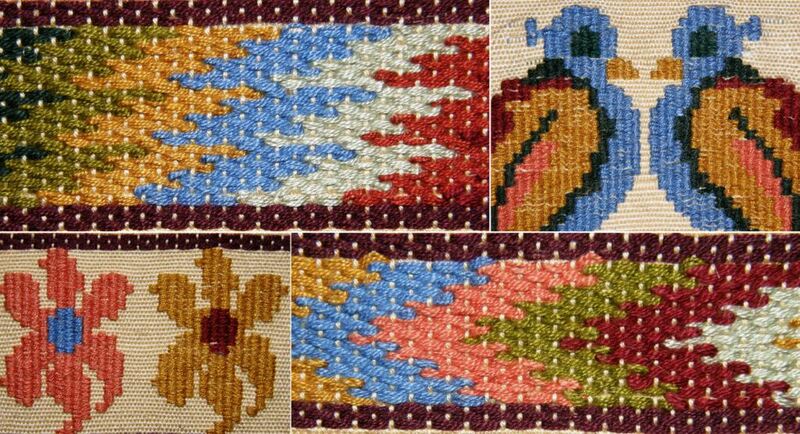 The weavers often use sheets and booklets of cross stitch patterns for design inspiration. Lidia took me yarn shopping and the little stores had many cross stitch magazines and individual pattern sheets. 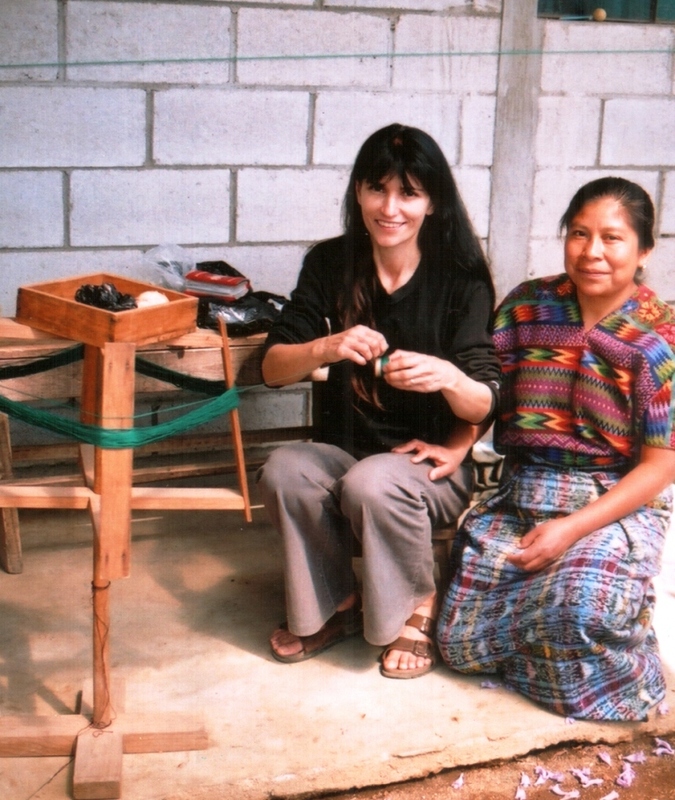 One of Lidia’s wishes was to to find patterns to which no one else in her community had access. Competition to sell weavings is fierce. You can see how I have chosen to chart the bee motif. Each filled square represents four passes of the supplementary weft (my two explanatory photos above show how to make two passes). A half-filled square, therefore, represents two passes. What is critical to the success of this technique, as with all work with supplemental weft, is finding the right balance in the weight of the ground weave material and the supplemental weft. That is a matter of trial and error. Supplemental weft that is too light will not provide enough coverage. The opposite will make it difficult to maintain a horizontal weaving line. One of these days I will make this a complete tutorial, take much better pictures than the blurry ones I took in low light this morning and fill in all the details. However, I have to tell you that this is the slowest and most tedious technique I have done so far! I wove my large piece with the quetzal birds (at left) when I got home as well as a couple more samplers, and I have not done anything with the double-faced technique since! I used the quetzal piece as my journal cover which was not such a great idea as you can’t see the other side and appreciate the double-faced nature of the technique. 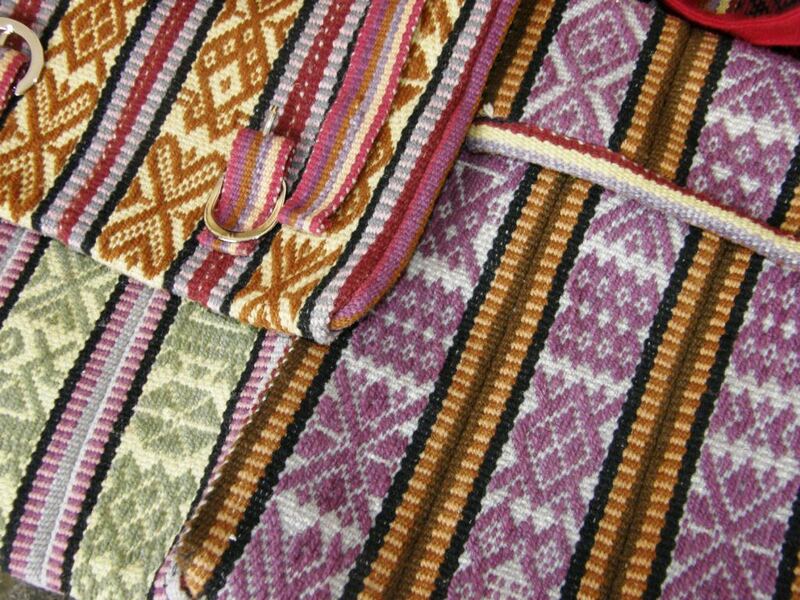 However, the Guatemalan weavers’ double-faced work is also hidden on the inside of their blouses. It’s time to get out some cloth and start practicing my stitching for the join in my two panels. I want my sewing to be as neat and pretty as my teacher Maxima’s is. I hope to sew triangular shapes, as she has, and I chose the supplementary-weft motif that I am weaving, with its sort of triangular base, with that in mind. Picture courtesy of PAZA Bolivia and Dorinda Dutcher. I will leave you with a couple of hat bands that Anne wove using the intermesh technique that we wove together on one of my visits. My teachers in Huancayo 19 years ago, taught me the intermesh structure with a two-heddle set up which makes it partly loom-controlled. You can see Anne’s two heddles and sticks holding her picking cross below. She has used the lettering that I include in my second book in which I also teach this structure. 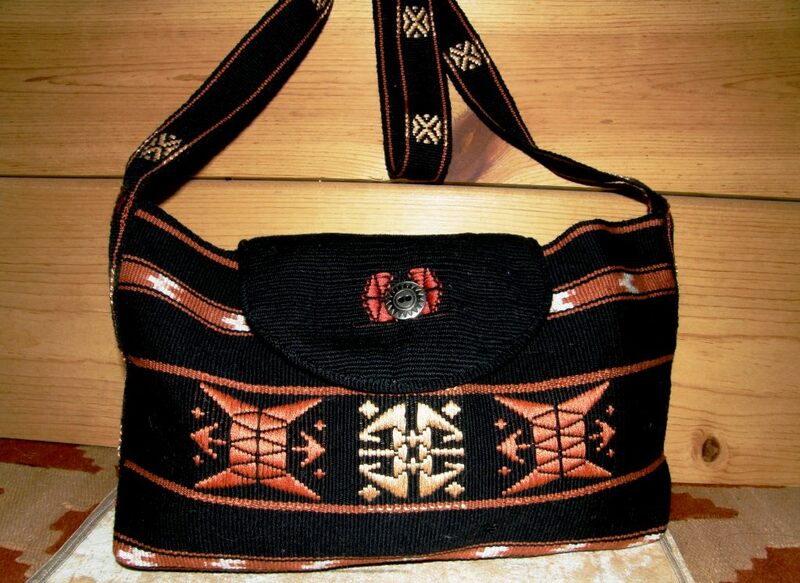 The other design is charted in my second book and was adapted from a Mexican tapestry motif. 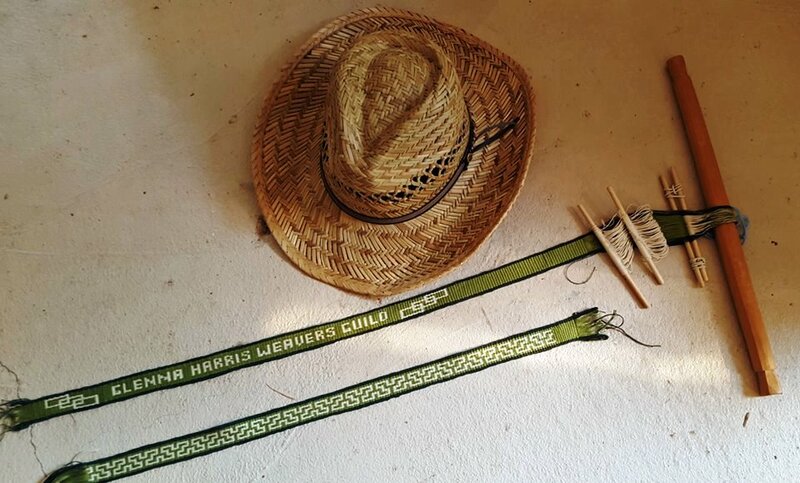 Anne started the hatband as part of a weaving get-together we had on one of my trips. It is lovely to see it finished. I think her hatbands have come out beautifully. Beautiful work! I love all your designs, bands and resulting fabrics. The double faced supplemental weft technique above resembles weft twining somewhat. It’s worked differently, almost like some tapestry weaving is done, but looks similar at the end. I look forward to more of your reminiscing. Thanks for all the work you share with us! Thanks for the comment and I agree with you, Amanda, the double-faced supp weft technique does look a lot like weft twining in the end. Hi Judi.Thanks for that link. Handeye has such great articles.I think you are right in that the little flower is embroidered. The angles of the diagonal lines vary and so I don’t think they could have been woven. In any case, it has given me ideas and I would like to try to weave shapes with that basic idea in mind. Goodmorning thanks for the blog. Iv complete a course in structural textiles design at Makerere University kampala uganda. For a good period of time i have been following posts on backstrap weaving.wordpress and im impressed. Throught my 3year course, i have picked a leaf from resources on your site and intergreted it in my projects. Today, after i am out of school i intend to start active weaving at my mothers house. While at the university, i mostly did my weaving using the frame loom, table loom, and floor loom. Not much of backstrap weaving but we were introduced to the inkle loom and comb loom. At my moms house, i will find these easier to access than the other types of looms and I expect to learn and perfect them along the way as i have already started with tutoring from your blog. This my post therefore is meant to thank you for allowing and sharing with us all over the world your lifes work and tutoring. Hi Kitto. Thanks so much for writing.I would love to see your weaving and the different things on which you have been working. I would also love to see you backstrap weaving in your home. Please keep in touch and I wish you all the best in your weaving. Thank you Laverne for inspiring me to start this again. I did do a short class a few years ago but continued on my large loom. I saw your blog and have been weaving in my garden. I love what you do but I am more of a fabric weaver so have started with a houndstooth scarf but will continue with wider pieces. I have a picture and small video of this but do not see how to send it to you. Thank you again. Thanks for writing . I wlll send you an email so you can send me pictures. Sounds like you are weaving rather large and long pieces.I would love to see you out in your garden using your backstrap loom..
Fabulous, Laverne! Your brown panels are so very lovely. No doubt the joining stitches will be equally as beautiful. Crazy, isn’t it, how yarn will act with a mind of it’s own, sometimes doing what we hope it will do, some times not. I’m delighted to see this technique of supplemental weft weaving as it is very much like something I’ve recently been trying. I was inspired by the Kente Cloth weaving that goes from warp faced to weft faced on the same warp. They do it in the same manner you have shown, by grouping multiple warps together creating plain weave that allows the weft to pack in and cover the warp. Fun! Thanks, Julia. I am happy I got to see your kente-style warp and weft faced piece in the Ravelry group and hope to show it here in a future blog post. I really like your website and I am using the tutorials to learn backstrap weaving. In your latest blog entry, you mention that you have a few broken warp threads. Is there any way to repair them? If not, how do you deal with them? Hi Jennifer. I deal with broken warp threads the same way that weavers using other looms do. If you Google ”How to fix a broken warp thread” you will find videos and tutorials. That would be more helpful than my trying to explain to you here in just words.